Hampi in Karnataka is a place like no other. It has the perfect setting of prestigious ancient ruins against the most jaw-dropping natural setting. 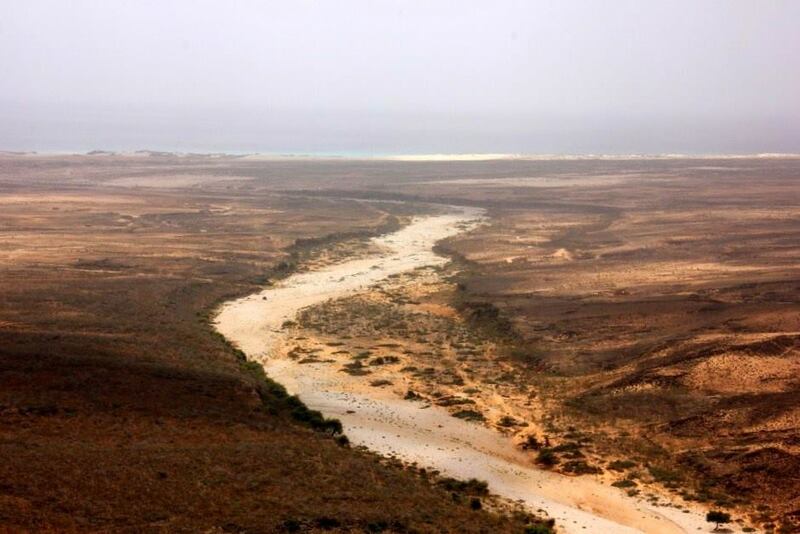 A laidback backpacker’s heaven, most travelers easily fall into its languid pace and in such a surreal place, it is not difficult to spend at least a week, if not more. Cheap, clean guesthouses, cafes, restaurants, motorcycle rentals etc make Hampi extremely tourist friendly and a couple of interesting day trips to nearby places make the Hampi experience complete. 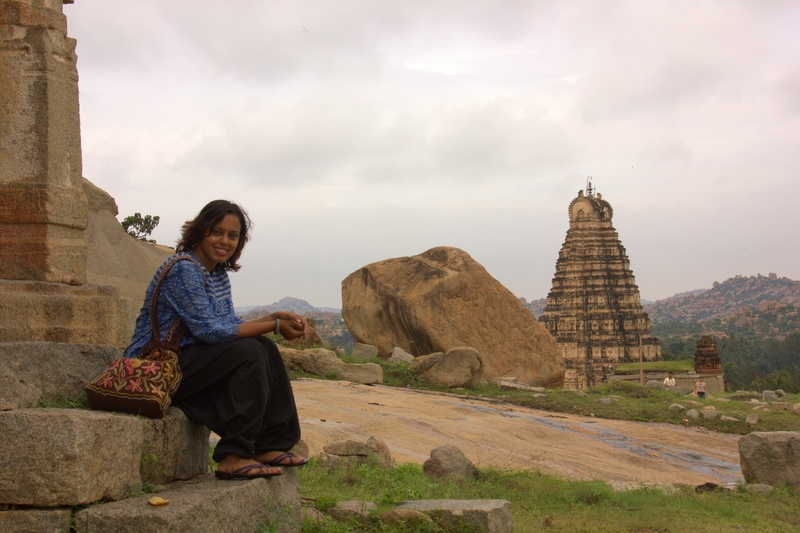 Presenting a few fun things to do in Hampi. 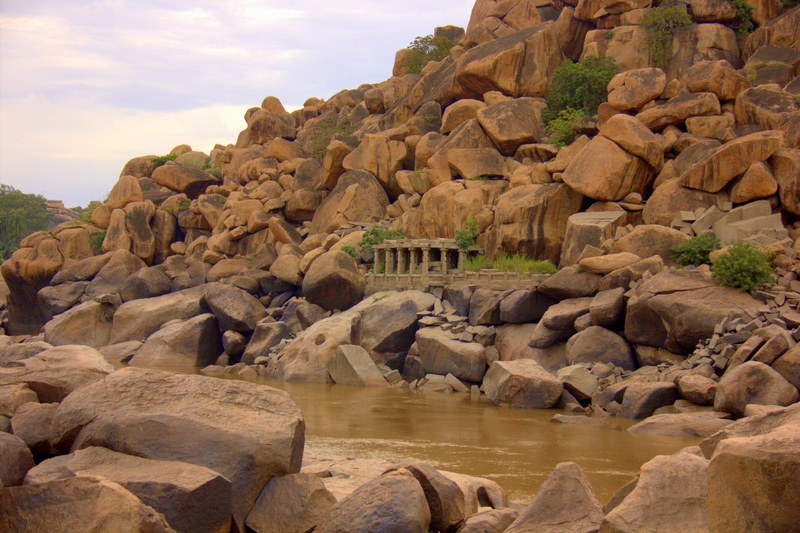 Hampi’s Vijaynagar ruins lie scattered all along Tungabhadra river and they can be explored on both the banks. Virupapur Gadde has a few half-ruined temples which require a bit of bouldering and make excellent viewpoints. The ruins can be divided into 3 parts – religious, civil and royal quarters. 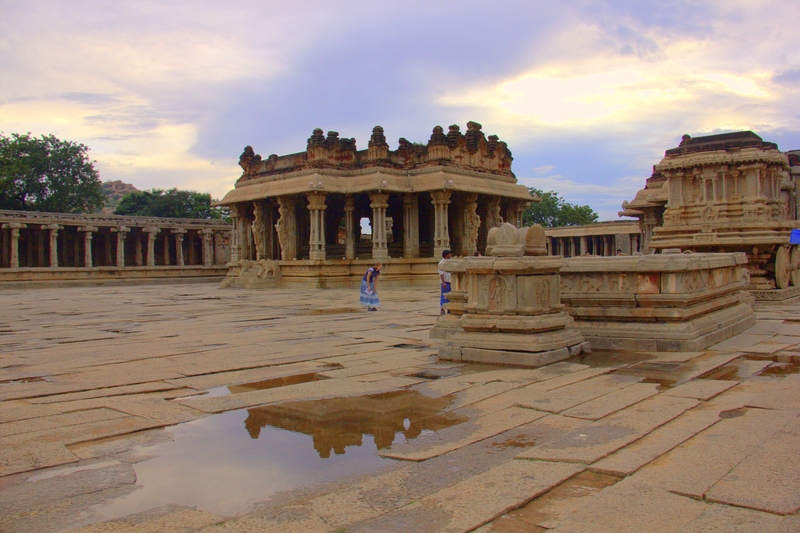 The Virupaksha and Vittala temples are magnificent and Virupaksha is a still functioning temple. Vittala with its magnificent stone chariot, hall with musical pillars will take half a day. 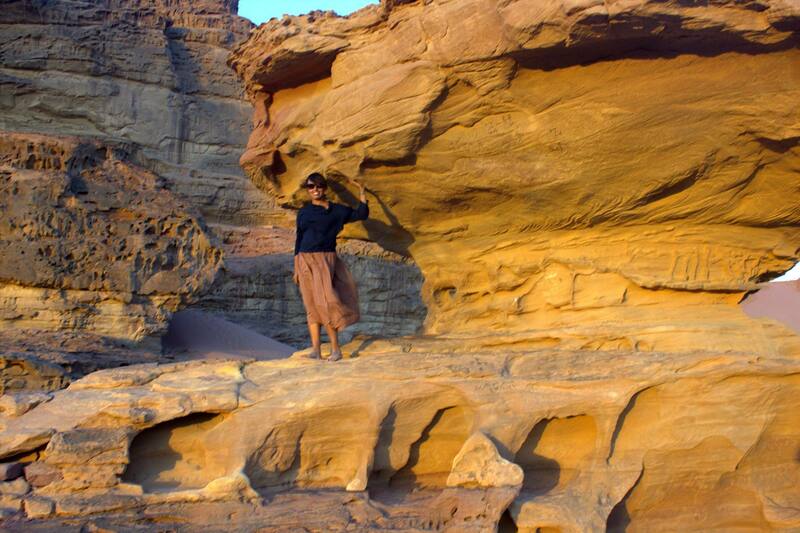 Walk along the river to explore submerged temples, matrix style Shiva linga rock face and religious tanks. Don’t miss the 2 Ganeshas both of which are located next to Hemkuta Hill, the Monolithic Bull, Hampi Bazaar (with Paan Supaari Street), the magnificent Narasimhan monolithic statue and the giant underground Shiva Linga. The Hazara Rama temple with its exquisitely carve exterior wall is not to be missed too. Rainwater mirroring the sky at Vittala temple complex. Climbing up the Hem Kuta Hill is a lot of fun. It offers excellent views of Virupaksha and surrounding areas, has gorgeous balancing boulders and is scattered with ruined civil structures, some of which are even double storeyed. There are a few active temples on the hill which attracts local devotees and caution needs to exercised while visiting them, as some are in dangerously dilapidated conditions. Virupaksha Temple deserves special mention because it is easy to dedicate half a day to its architectural grandeur. Starting from following the temple elephant when it goes to the river to fetch water for the deity, to taking a guided tour to understand its architectural marvel (the inverted pinhole camera included) and photo capturing its colourful pilgrims’ jostle, Virupaksha is as lively as it gets. For stunning Virupaksha views, climb up the streaked sheet-like undulating Hem Kuta Hill. Hampi Festival also known as Hampi/Vijaya Utsav is celebrated from the times of the Vijayanagar reign. Karnataka Government continues to promote the festival and each year, a cultural extravaganza is held amidst the glorious ruins. Grand parades of elephants, horses, and men dressed in the Vijaynagar military fashion march underneath the red, yellow, blue and white clothed “Gopuras” which line the Hampi lanes. Classical dance exponents and classical vocalists entertain the guests with their brilliant performances in as many as five different venues. Held every year in January, a special light and sound show is also introduced during the Hampi Festival. Hampi mornings are always fantastic. Although most of Vijaynagar dynasty’s palaces and royal quarters have been destroyed during the siege, some of its most beautiful structures still remain. The Lotus Mahal is an exquisite stucco building with delicate floral frieze decorated doorways which look like petals, stunning intricate jharokhas (overhanging balconies) looking into an indoor pool and some traces of ceiling paintings remain at a few places. The nearby Elephant Stable is another well preserved grand structure and apart from that there’s Queen’s Bath, Stepped Bath, Royal Enclosures, remnants of the city’s fortifications etc. 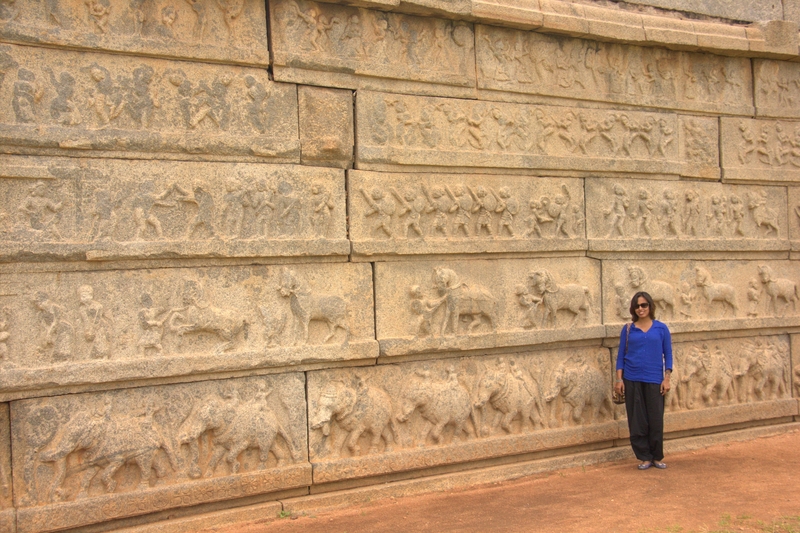 The stunning bas reliefs at Hazara Rama temple in the Hampi Royal Enclosures. Try out the Ramayana trail and cross the Tungabhadra river to visit the old capital of Anegundi. You can reach Anegundi either by ferry (which ferries your scooter to) or drive along Bukka’s Aqueduct from Virupapur Gadde. Climb up the Hanuman Temple on Anjenaya Hill to pay the monkey god’s birthplace a visit and the Pampa Sarovar is also worth a visit. Try one of the basket-shaped coracle boats to float down Tungabhadra and most boatmen stop at places of interest. 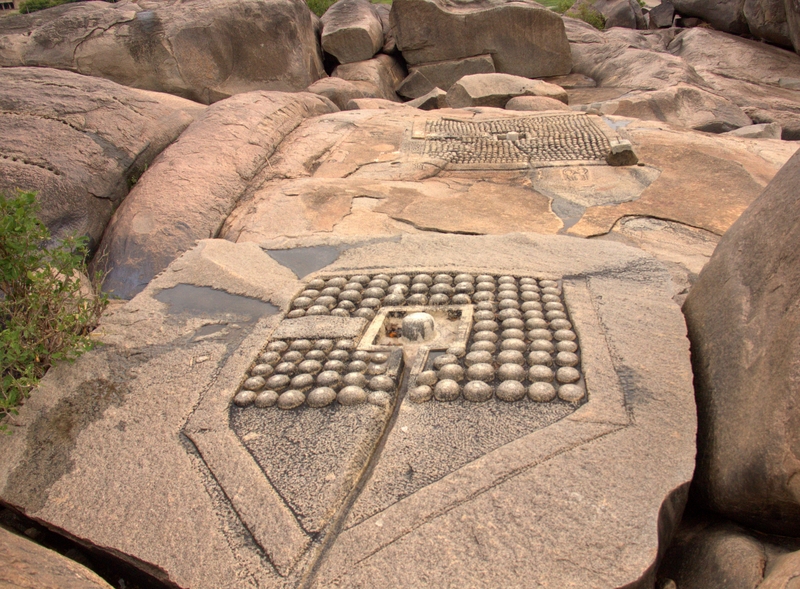 The area surrounding Hampi is strewn with picturesque boulders, some of which seem precariously balanced. Bouldering is a must for adventure lovers and there is a local outfit at Virupapur Gadde, which offers services and equipment to rock climbers. Sunrise hikes to obscure temples are also arranged by them. Coracle boat on the Tungabhadra river in Hampi. 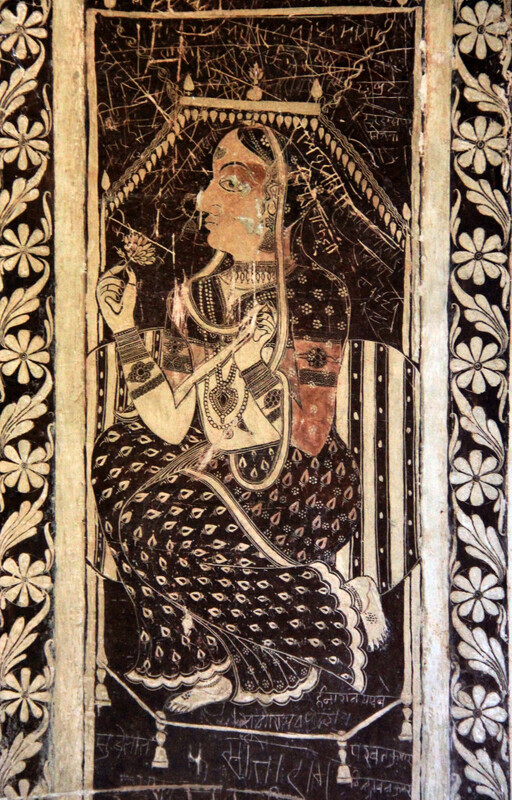 The Hampi village is uniquely global and exotic at the same time. With interesting cafes, yoga classes (practice morning sessions among the ruins), friendly locals, hole in the wall shopping options and restaurants like the Mango Tree (which doubles up as the travelers’ hangout place), Goan Corner, Hampi is as global as it gets. Add to that colourful jostle of pilgrims from all over India, quaint quintessentially Indian markets, outlandishly attired nomadic magicians and monkeys, you get a tranquil old civilization which is exotic in the truest sense. Go exploring by bike or motorcycle to the surrounding villages and you will fall in love with the real India. Waving paddy fields of ripe gold, banana plantations, sugarcane forests, and charming village scenes, bell decked bullock carts, flower-adorned ladies and idyllic pace of life will take your breath away. Haboundsunded with wildlife and nature enthusiasts can visit the nearby Daroji Bear Sanctuary to see sloth bears. Locals warn travelers of prowling leopards, sloth bears at night and Tungabhadra River has pretty vicious whirlpools, eddies, and crocodiles. Swimming is prohibited and it is advisable to not wander around the ruins after dusk. Hospet town is pretty much missable and it is as miserable as it gets. Filthy rubbish heaped lanes, broken roads, open sewers, pollution and chaos rules the town, which is the gateway to Hampi. 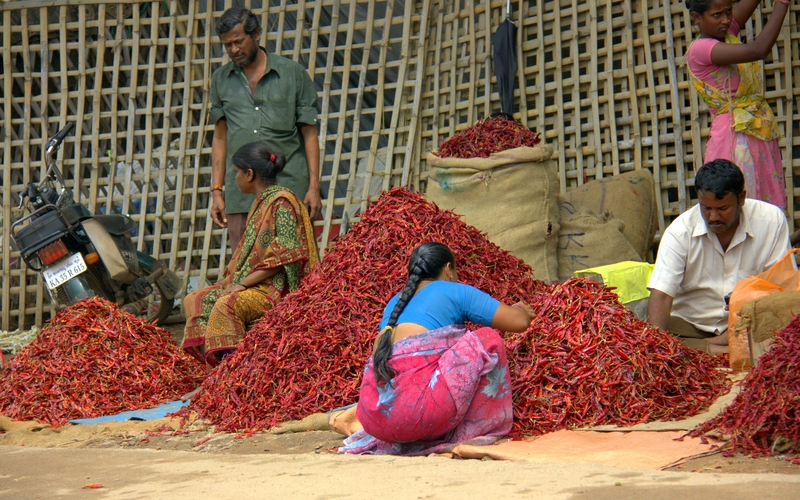 However, photographers might like to visit the Hospet market to find an incredible array of colours (spice market, flower market, fruit market etc). Foodies will fall in love with the Bellary Biriyani (the best one available at Bellary Biriyani Paradise), a rich flavourful chicken/lamb based rice dish and add a cold glass of buttermilk for the ultimate culinary delight. For a comprehensive travel guide on Hampi, check out the Tale of 2 Backpackers. Nature lovers will the lovely Sanapur Lake and Hampi’s best sunsets can be spotted from Matanga Hill. Try the Tungabhadra Dam if you have an extra day with you and would love to indulge in some offbeat fun with the locals. Nestled among a well-kept garden, the Tungabhadra Dam reservoir is vast and the hilltop view of it is incredible. A small bus shuttles tourists from the Tungabhadra Dam park to the hilltop and there’s a small coffee shop there. Love this place and feel I was part of it in my previous birth some centuries ago! Have a wonderful day dear. Thank you very much Rekha. Have a lovely weekend. 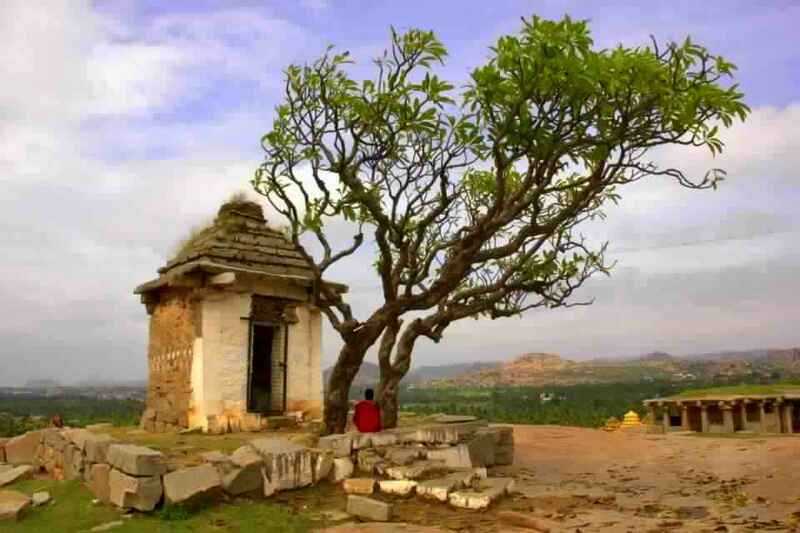 Nice list of Things to do in Hampi. What a unique place! 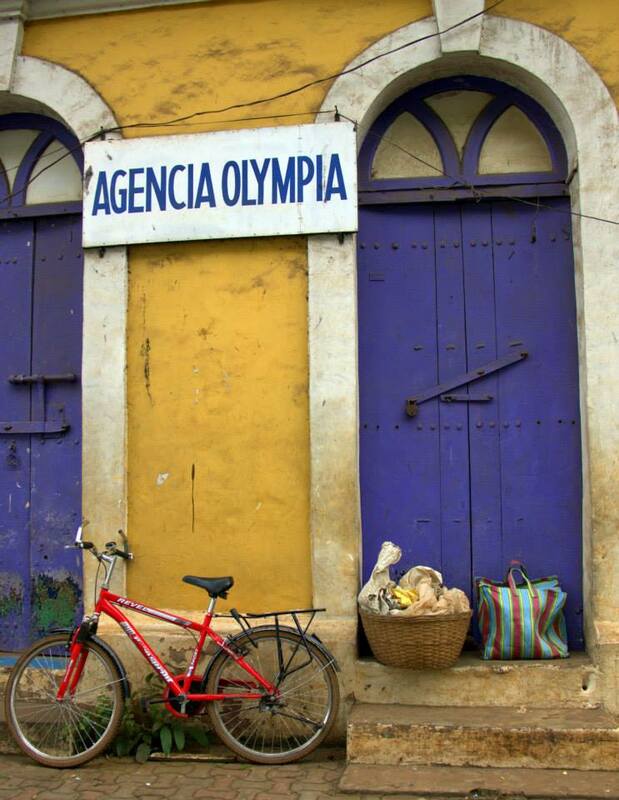 Great post and images! Wow! you are right – the first photo of the stone carriage is magnificient, the second photo of the girl is glorious, and the rest of the captions of all the photos capture their essence so well. Perfect. Atop that, great travel guide. 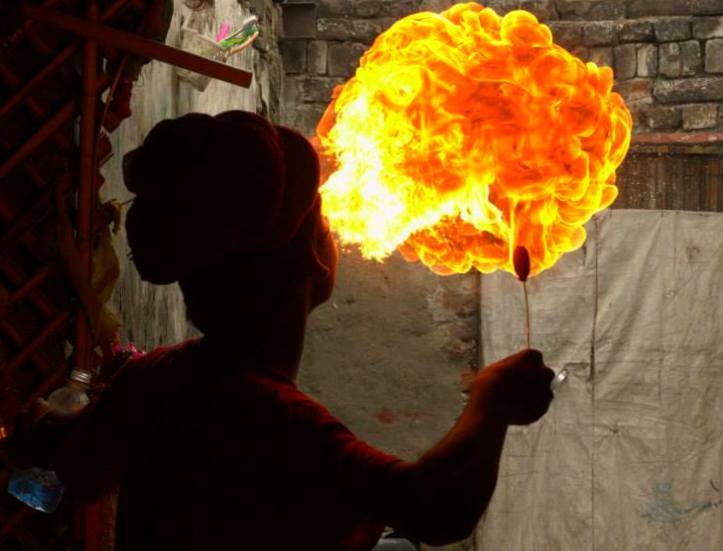 I’m going to have to come back and take in those photos more later – they are brimming with life and meaning. The stone carriage picture, the first one, reminds me not for the first time, of the many similiarities between ancient China and India. Whats the story with the sculpted balls in the rock and the other rock carving? ( the ones you have tagged as charm or something) Very intriguing. thanks for dropping by my spaceship today, it made me come here and see this fantastic post. Thank you very much Debbie. 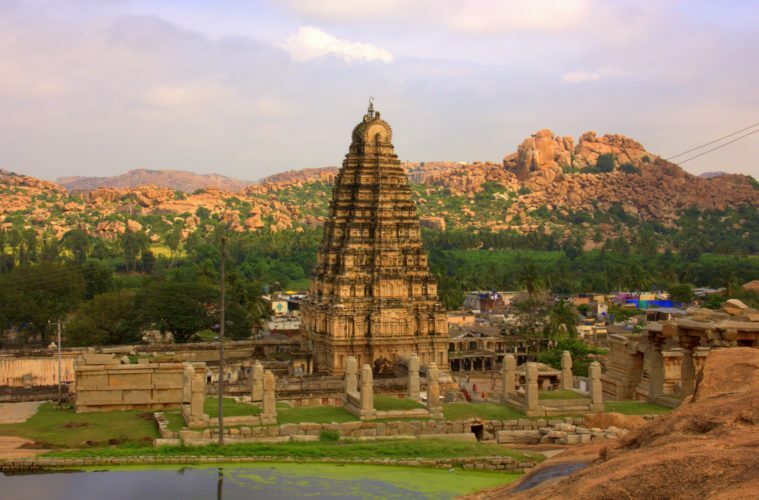 Hampi is very beautiful and it is a site for ruins of an ancient kingdom. The carvings and sculpted balls on the rocks all belong to that kingdom. Hampi is beautiful. Thank you for your kind words. I mean where do I Climb to reach here? This is in Hampi. 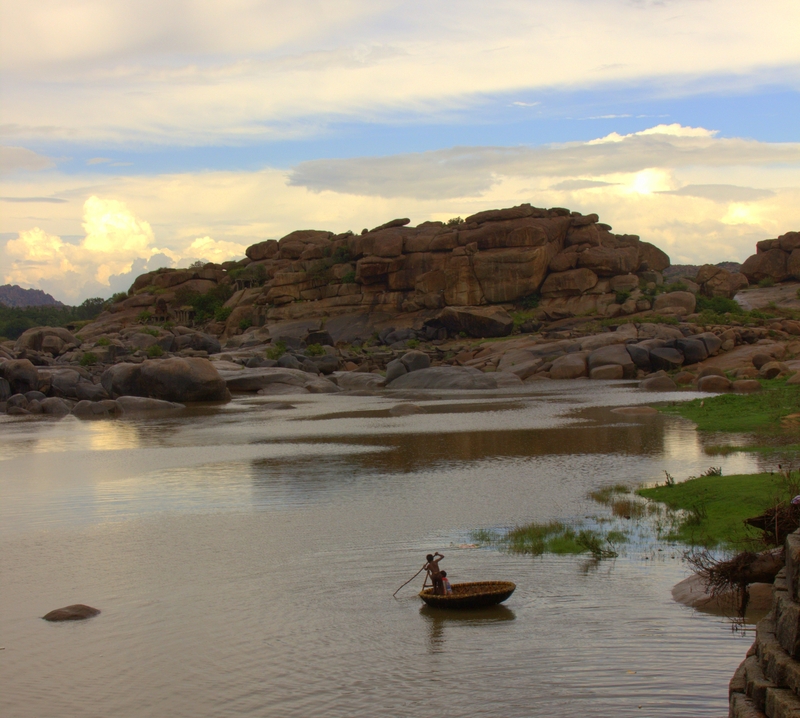 You have to walk along the Tungabhadra River to reach there. COULD YOU TELL ME THE DURATION (NUMBER OF DAYS) OF YOUR TRIP? HOW MANY DAYS WOULD WE NEED THE LEAST TO SEE HAMPI? 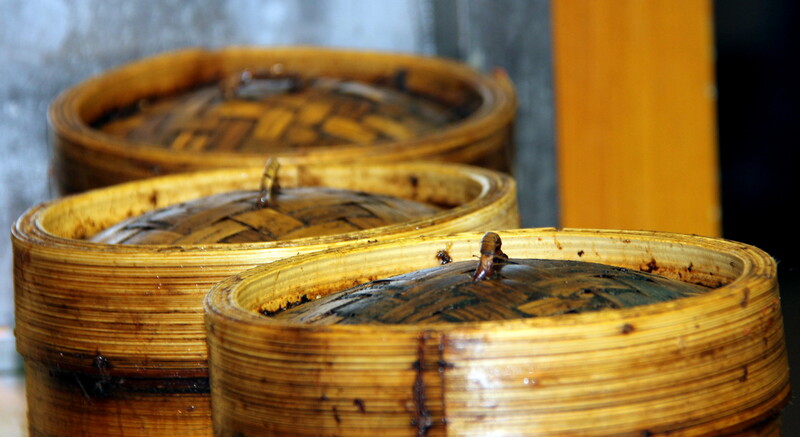 ALSO SOME REAL AMAZING DISHES TO TRY. Hi Sanyukta. I spent a week there. In my opinion, 3 days is pretty okay to explore Hampi ruins along with a brief visit to the sloth bear sanctuary. The highlight of rural Kannada cuisine is mudde with some kind of stew (meat/chicken) or sambar. I had it at a friend‘s house. Dont know if it is available at small dhabas there, but if you are in Bellary town, dont forget to try the Bellary Biriyani. Hope it helps. Have a good time at Hampi. Thank you very much. I loved Hampi.